Most introductory books about computers are either long, detailed technical books such as those used in a computer science course or tutorials that provide instructions on how to operate a computer with little description of what happens inside the machine. This book fits in the large gap between these two extremes. It is for people who would like to understand how computers work, without having to learn a lot of technical details. Only the most important things about computers are covered. There is no math except some simple arithmetic. The only prerequisite is knowing how to use a web browser. The fundamentals of hardware, software, the Internet and smartphones are explained, using examples and diagrams that are easy to follow. This book only covers current day technology. 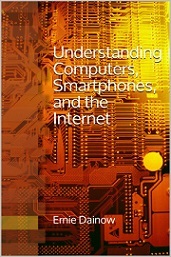 People who are interested in learning about how computers evolved from the earliest machines can read the companion book “A Concise History of Computers, Smartphones and the Internet”, by Ernie Dainow. While primarily intended for people who are not in the computer field, this book is also useful as adjunct reading for those taking a coding course or an introductory computer science course. Even people already in the computer field will find things of interest in this book. Ernie Dainow has been a technologist and writer for more than 30 years, as executive editor at PC/Computing, BYTE.com, and GroovyPost.com. He has won awards from the Computer Press Association, the National Endowment for the Humanities, and the Robert F. Kennedy Journalism Awards.